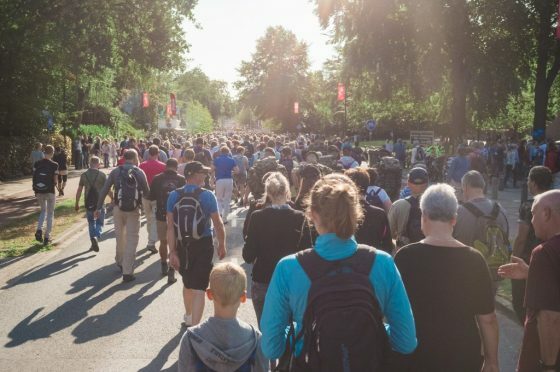 On Saturday 1 September 2018, the 72nd edition of the Airborne March (Airborne Wandeltocht) took place in Oosterbeek, the site of many of the Operation Market Garden airborne landings just to the west of Arnhem in the Netherlands. It is the largest one-day commemorative march in the world and has taken place yearly on the first Saturday of September, since 1947. 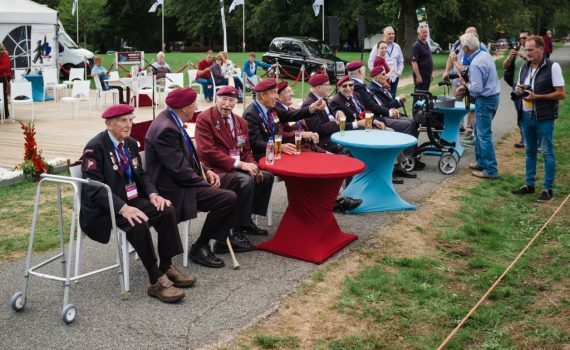 The Airborne March is organised to remember the Battle of Arnhem which took place in 1944 and this year, it was marched by 32,809 participants from more than 20 different nationalities, one of whom was Lgr Charlie Wessels, who participated wearing her South African Legion colours and representing the Europe Branch. It’s the third time she has participated. 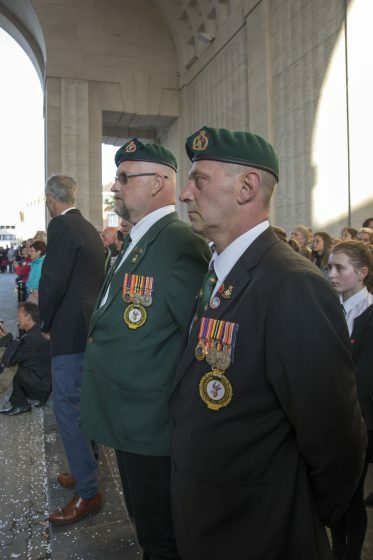 The distances vary from 10 – 40 kilometres and the event is attended by people of all ages and backgrounds, including veterans, living relatives, soldiers, cadets and civilians, paying their respects. All routes start and end at the sports park Hartenstein in Oosterbeek. 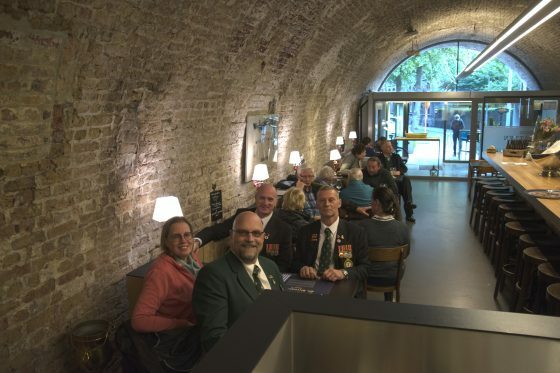 The revenue from the march is used to enable veterans and their next of kin to come to the Netherlands and attend the commemorations in and around Arnhem. The atmosphere during the whole day can only be described as incredible. Marchers form up and register in the sports park before being ‘lead out’ past the Airborne Museum by one of the more than 30 Music Corps, who take part in the event. Along the route there are stands selling refreshments, volunteers who assist with First Aid and general morale along the way and marchers (from all walks of life who join in on foot or in wheelchairs) who freely chat with each other and who all end up feeling like your ‘Brothers in Arms’. 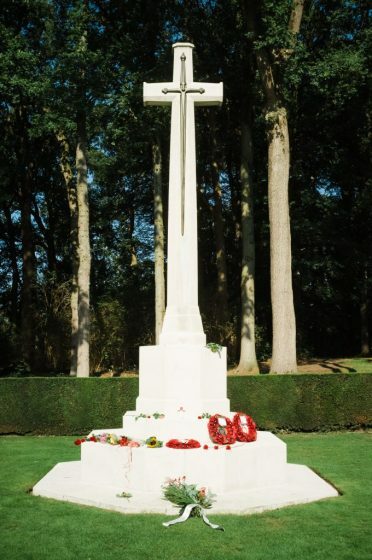 The marching routes lead past the most important wartime locations in Oosterbeek, including the Airborne Cemetery, where over 1,700 British and Polish soldiers are buried. As jovial as the march is along the way, the atmosphere once you enter the Airborne Cemetery is in stark contrast and changes to quiet and respectful. The local population in Oosterbeek make a real effort to let all participants and visitors feel welcome. They decorate the streets and the Pegasus flag flies proudly on each mast outside the homes. They even provide for snacks and water along the route and sit outside their homes to cheer the marchers on. The distance you choose to march and the weight you carry, are all down to personal choice, it’s not a competition. Regardless how far you chose to march, marching up that final hill in Oosterbeek before entering the festivities of the high street, takes some gritting of teeth. The happy tunes from the Music Corps leading the marchers back through the gates to collect their medals at the sport park and the cheering of the crowds, are quite overwhelming. Cheers to all who have taken part in this march over the past 72 years and especially, to those we are marching for. 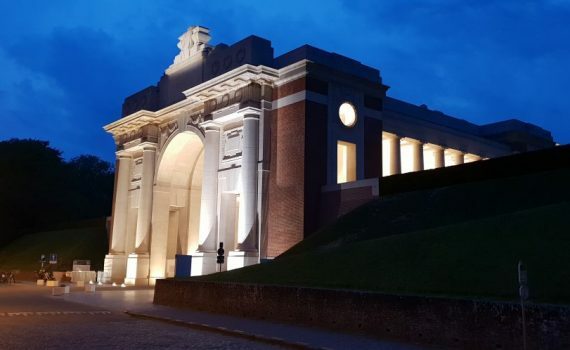 Every evening at 20:00 sharp, ever since 1928, the solemn and stirringly beautiful Last Post ceremony has been performed under the Menin Gate at Ypres that commemorates the many thousands of British and Commonwealth soldiers who were killed in the bloody battles of the Ypres Salient during First World War. 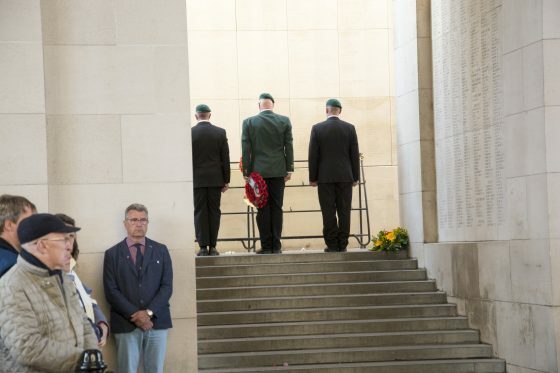 On the walls of the memorial are inscribed the names of 54,395 soldiers – including South Africans – who died in the Salient but whose bodies have never been identified or found. On 12 and 13 May, Ypres hosted the Kattenstoet (Cats Parade), a festive local carnival themed on cats, which was an extra attraction on this weekend. 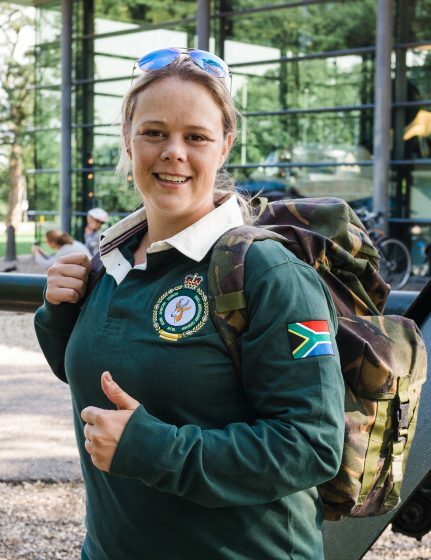 South African Legion (Europe Branch) Chairman Lgr. 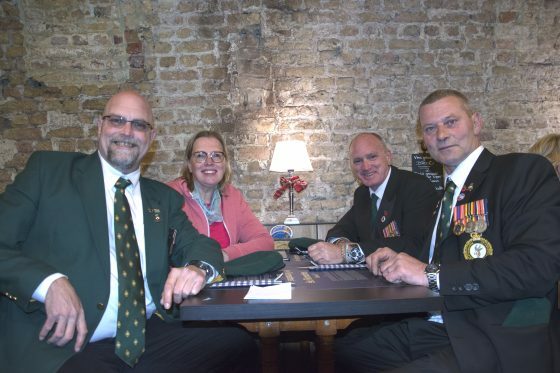 Andrew Bergman arrived with his wife Johanna on Saturday evening and attended the Last Post Ceremony as a ‘dry run’ to recce the lay of the land. 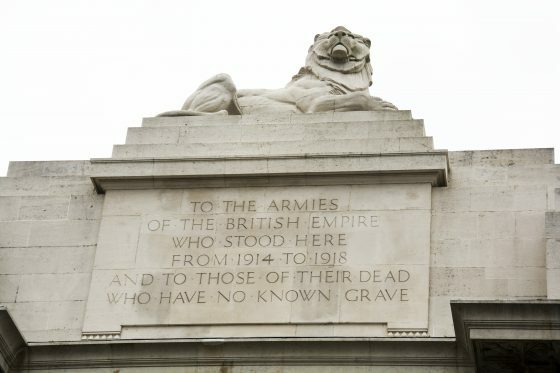 An advance email to the Last Post Association in anticipation of our visit yielded and invitation to lay a wreath, as well as the possibility (at the discretion of the Master of Ceremonies on the day) to deliver the Oration or Epitaph with an official delegation the following day. On Sunday, Lgr. Dave Wiseman and Lgr. 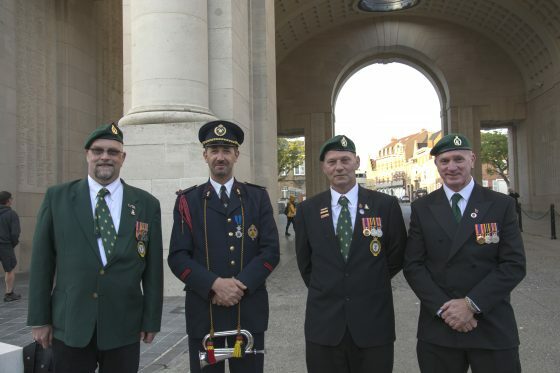 Clint Olivier crossed the Channel and arrived in Ypres in time for the Cats Parade. We then got together – dressed in our parade kit – at a café opposite the Menin gate, where we were treated like minor celebrities. 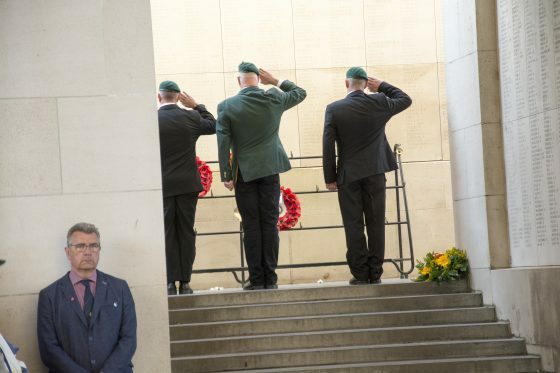 We then moved to the Menin Gate, where the Master of Ceremonies asked Lgr. Bergman to deliver the Oration during the ceremony. Then a pleasant surprise: MOTH Alex Cromarty happened to be in the area touring with his family, which swelled our ‘band of brothers’ to four. Our wreath-laying party fell-in three-abreast under orders of the Master of Ceremonies. 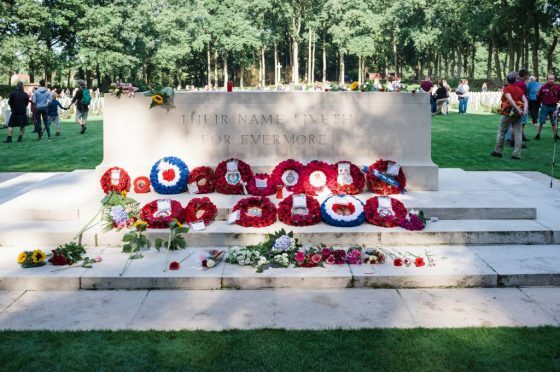 Behind us were schoolgirls from Scotland and England, students from East Anglia University, and ancestors of the fallen, all waiting to pay their floral respects. Opposite us, the Rochdale Festival Chorus gathered to provide musical accompaniment. By now there was no more room under the vast arch of the gate itself, and spectators were spilling out into the approaching road on both sides. A minutes’ silence followed, and then in perfect unison, the buglers sounded the mournful Last Post. There were not many dry eyes in the house. 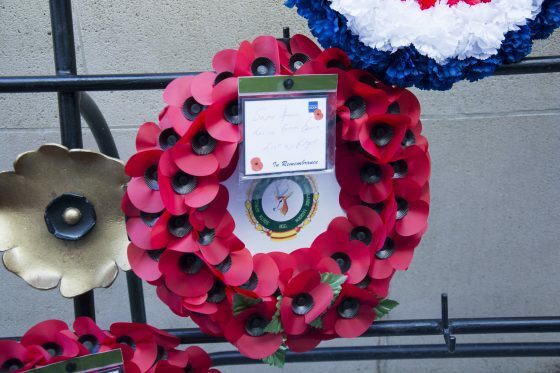 First to lay wreaths were the Mayor of Ypres and the Mayor of Singen, a German city that is twinned with Ypres. 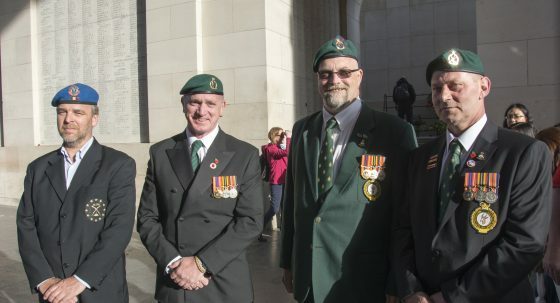 Both had been formally introduced to the South African Legion delegation at the start of proceedings. 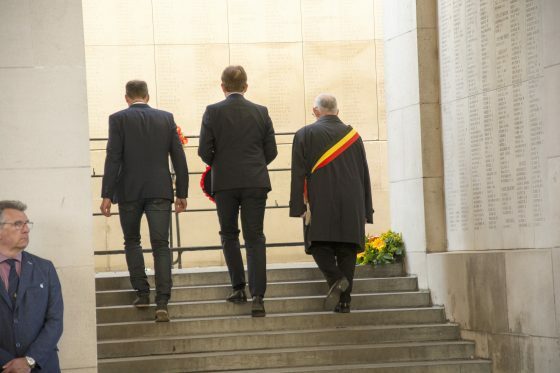 We were the next wreath-laying party, and while we haven’t done much marching together, we did ok – the pictures show that our dressing never wavered, we kept perfect step. The buglers then sounded Reveille to signal the end of the ceremony. After the ceremony was over, it was time for networking. 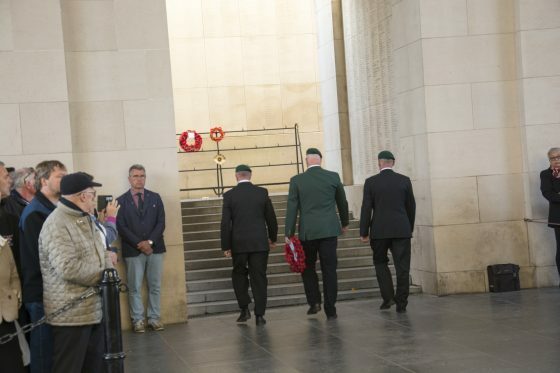 Legionnaires spoke to a Colonel (in civvies and ‘off duty’) from the Belgian Special Forces, and we mingled a while with the other wreath-layers in the afterglow of the dignified and solemn ceremony we’d all shared. So after a successful round of shoulder-rubbing with the Great and the Good of Ypres and beyond, three Legionnaires and Johanna – who had resolutely defended her plumb photographic position from several assaults on both flanks to produce a superb photographic and video record – followed the city walls southwards to have supper at Brasserie Kazematten, which is established in the ancient casemates within the fortifications of Ypres. Many of the original features are retained. The staff treated us like kings and it proved a fitting end to a memorable day of remembrance and fellowship.